Here, we’ve taken a definition from WordNet and prefixed it with the word followed by a colon and parsed it using the Linguist. Projects involving drugs or medical devices other than the use of an approved drug or medical device in the course of medical practice and projects whose data will be submitted to or held for inspection by the FDA will not be exempt from JHM IRB review UNLESS that use falls within the Emergency Use provisions of 21 CFR 56.102 (d). At the SemTech conference last week, a few companies asked me how to respond to IBM’s Watson given my involvement with rapid knowledge acquisition for deep question answering at Vulcan. My answer varies with whether there is any subject matter focus, but essentially involves extending their approach with deeper knowledge and more emphasis on logical in additional to textual entailment. Today, in a discussion on the LinkedIn NLP group, there was some interest in finding more technical details about Watson. A year ago, IBM published the most technical details to date about Watson in the IBM Journal of Research and Development. Most of those journal articles are available for free on the web. For convenience, here are my bookmarks to them. Good technical details on the two parsing approaches taken. Using deep parsing, such as we have (e.g., using the ERG in Project Sherlock) and disambiguation is a viable approach for the background knowledge that IBM dismisses too quickly, however (see below). Note that in order to train NLP systems in new domains, you have to go through the same process for thousands of sentences, so disambiguation technology as in the Linguist is appropriate even if proofs are based more on textual entailment than logical deduction. Benjamin Grosof and I will be presenting the following review of recent work at Vulcan towards Digital Aristotle as part of Project Halo at SemTechBiz in San Francisco the first week of June. We show how users can rapidly specify large bodies of deep logical knowledge starting from practically unconstrained natural language text. English sentences are semi-automatically interpreted into predicate calculus formulas, and logic programs in SILK, an expressive knowledge representation (KR) and reasoning system which tolerates practically inevitable logical inconsistencies arising in large knowledge bases acquired from and maintained by distributed users possessing varying linguistic and semantic skill sets who collaboratively disambiguate grammar, logical quantification and scope, co-references, and word senses. 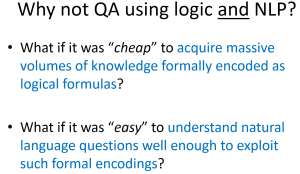 The resulting logic is generated as Rulelog, a draft standard under W3C Rule Interchange Format’s Framework for Logical Dialects, and relies on SILK’s support for FOL-like formulas, polynomial-time inference, and exceptions to answer questions such as those found in advanced placement exams. We present a case study in understanding cell biology based on a first-year college level textbook. Capturing some policies from a publication by the Health and Human Services department recently turned up the following…. It’s probably the case that there are more specific lists than just “some list” or “any list”, as suggested below. This is a good thing about applying deep natural language understanding to policy statements. It helps you say precisely what you mean, even if you are not using a rule or logic engine, but just trying to articulate your policies or requirements clearly and precisely. Work on acquiring knowledge about science has estimated the cost of encoding knowledge in question answering or problem solving systems at $10,000 per page of relevant textbooks. Regrettably, such estimates are also consistent with the commercial experience of many business rules adopters. The cost of capturing and automating hundreds or thousands of business rules is typically several hundred dollars per rule. The labor costs alone for a implementing several hundred rules too often exceed $100,000. 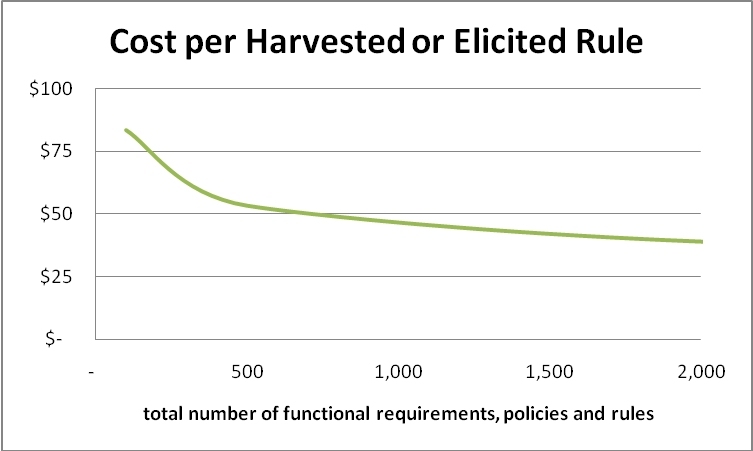 The fact that most rule adopters face costs exceeding $200 per rule is even more discouraging when this cost does not include the cost of eliciting or harvesting functional requirements or policies but is just the cost of translating such content into the more technical expressions understood by business rules management systems (BRMS) or business rule engines (BRE). I recommend against adopting any business rule approach that cannot limit the cost of automating elicited or harvested content to less than $100 per rule given a few hundred rules. In fact, Automata provides fixed price services consistent with the following graph using an approach similar to the one I developed at Haley Systems.